LAHORE: (Thursday, November 22, 2018): Punjab University Institute of Applied Psychology (IAP) will organize an international conference of “Applied Psychology: Practices and Interventions (ICAP-2019)” form 6th to 8th February, 2019. A Series of pre-conference workshops have been initiated with its reference. In this regard 2-day workshop was held on ‘Structural Equation Modeling (SEM) using AMOS’. 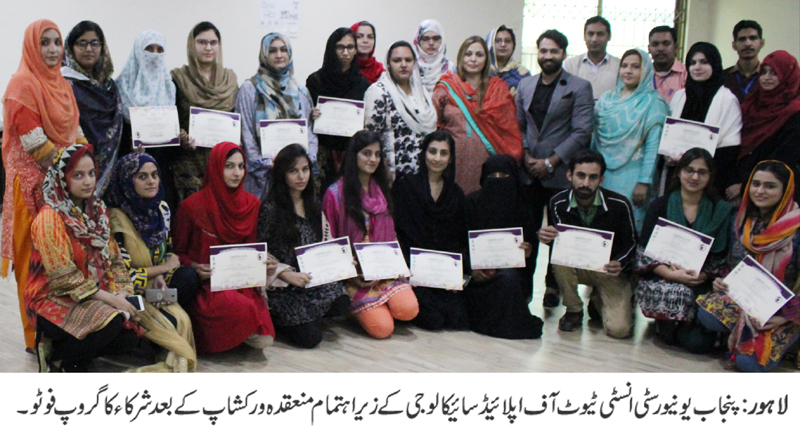 University of Management and Technology Department of Psychology’s lecturer Muhammad Faran was the resource person while the workshop was attended by the faculty members and students from various universities. The workshop provided a promising opportunity to the attendees to enhance their understanding on intricacies of conducting statistical analysis through AMOS to be used in various research setting. The Director and chief organizer Prof Dr Farah Malik and the organizing secretary Dr Mujeeba Ashraf distributed the certificates to the participants at the end of the workshop.